He's usually a challenge to color due the multi colors and pattern, but shading and texture came out great. ^^ Really satisfied with it. Marks on body: Bite scar on right hand. 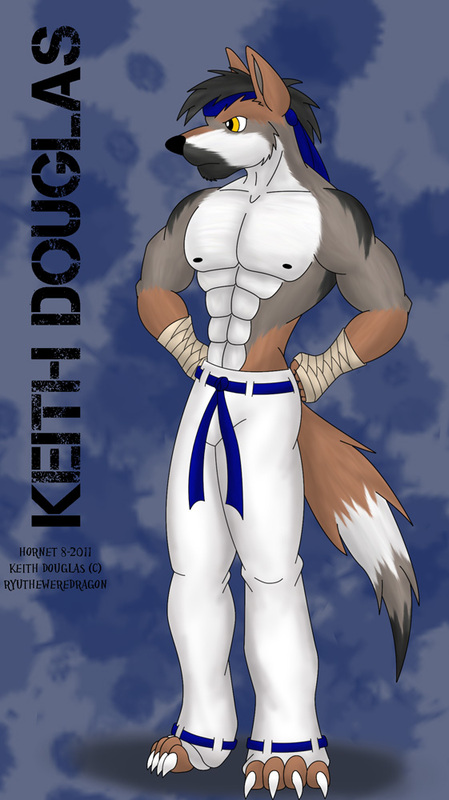 Bio: Keith is a calm and serious guy, an exceptional fighter who prefers to avoid unnecessary riot. He's very mysterious about he's past, the only known thing is he's been traveling by himself since young. He was bitten by a werewolf in his early teens, in his hand as he was about to throw a punch to defend himself. His usual training helped him to control the inner beast fully. In his travels he came across some members of Kyra's Pack. He spotted and managed to rescue a Charlie in trouble, who after being rescued, introduced Keith to the pack. Kyra saw interest in him and his abilities, and asked him to join the pack. He made fast friends with many of them, and usually helps in the training sessions. Keith tries to avoid trouble and fighting with people he consider weak, this led once an argument with Chris as he thought Chris was not of the fighting type. Things got sorted out fast and easy.